I'm a huge fan of deep conditioners and I more often that not, use them as my normal conditioner as my hair is so dry. I usually stick to the shampoo's I know I like but when it comes to conditioner, I always like to try something new. I hadn't heard too much about the brand Davines before trying out one of their products. They've been included in Glossyboxes recently, the two products are actually on my list of things to try out. 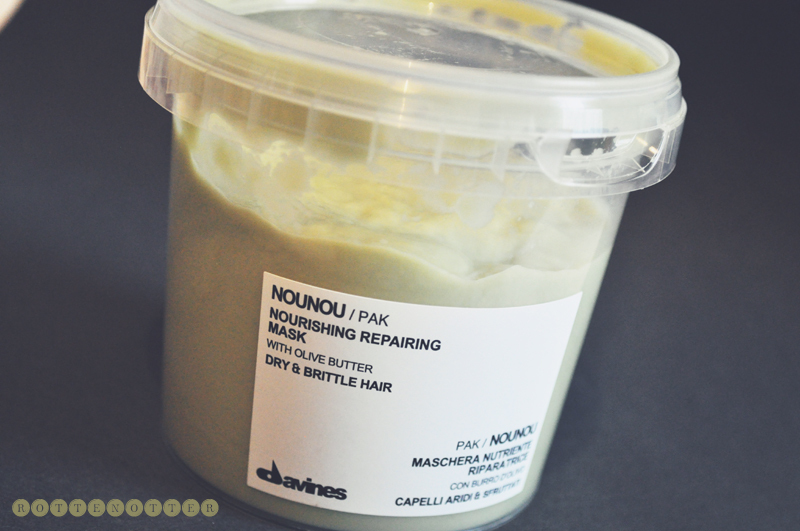 Over the past month or two I've been using the Nounou/Pak Nourishing Repairing Mask* designed for dry and brittle hair which basically describes my own. The olive butter in it helps to tame fly aways whilst softening and nourishing the hair. I either mix this with a normal conditioner and wash it off after 5 minutes or if I've got more time, I'll leave it on for 30 minutes on towel dried hair. It has a very strong scent which I just associate with hair care products but neither my mum or I can pin point what it is. It's really made a difference with how knotty my hair gets and has made brushing so easy. What's impressed me the most is the ends of my hair have been transformed and no longer look as dry and damaged as they really are. Despite it being a thick treatment, it doesn't weigh the hair down so it'll be perfect for those with fine hair. For some reason this just doesn't seem to going down! I use quite a lot of product as I have very long hair but it looks like I've hardly used any. The photo below was taken after about 3 uses and it's only up to the label at the moment after about 5 or 6 uses. The tub is really deceiving as I thought I'd use it up after only 2 washes. Talking about the tub, it's not the best design as the lid doesn't close 100% so wouldn't travel well at all once opened. It's fine though for using at home. From looking online the price seems to range from £15-18 which is on the more expensive side of deep conditioners but I'd buy it again as a treat. The only downside to this and other Davines products is accessibility. You can't buy them from the website although there are salons across the UK. Hopefully this will change at some point. This particular product has had rave reviews on MakeUpAlley as well which I always check before buying a product. Have you tried anything from Davines? Did you get them in your Glossy Box? Well, I have read information provided in this topic thoroughly. People who love their hair are always in tension to care about their hairs. I also use different method to make my hair good looking. Some people uses wigs and some other uses different hair polishes. Some patient use cancer patient wigs to protect their hairs. This is really a great mask for hairs to make them more good looking and stylish.